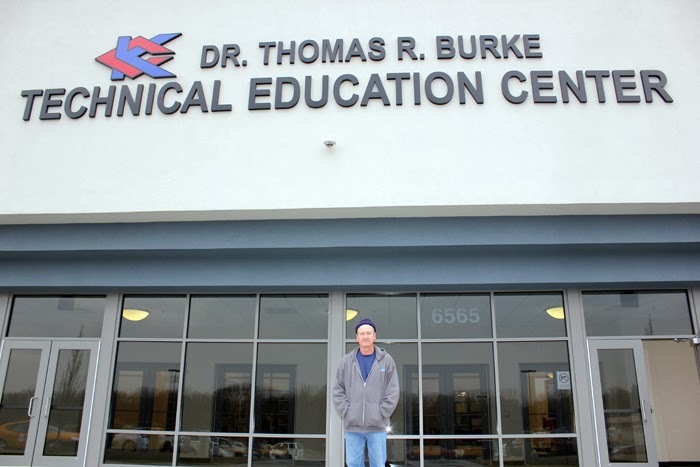 KANSAS CITY, KAN. ----- When Rodney Ashley was working on the construction of the Kansas City Kansas Community College Dr. Thomas R. Burke Technical Education Center last year, he felt like he had come full circle. The lifelong Kansas City, Kan. resident not only graduated from Wyandotte High School in 1976, but one year later, received a certificate in Building Trades from what was then referred to as the Kansas City, Kansas Area Vocational Technical School (now KCKCC-TEC). Ashley said he enjoys building trades because he liked working with his hands. He also took the Electrical Motor Controls class and Pre Heating and Cooling class at the school, where he learned how to charge air condensers. Ashley remembers many of his teachers from his time at AVTS, but there was one that really stood out - Joe Jennings. In fact, the educator made such an impact that he was the best man at Ashley’s wedding. Ashley’s first job was with Brame Custom Builders, a local company that built houses. He said they had a few contracts and needed carpenters. Although he was not finished with his certificate, he worked while finishing school. Ashley described that first job as “pretty neat,” describing how he learned to install a floor by driving nails with one hit. After three months, he got a call from an apprenticeship program. In addition to his hourly pay, he became vested in the insurance and pension program. After four years, he became a journeyman. An individual earning a journeymen’s card is equivalent to a person earning a bachelor’s or master’s degree. The first union job for Ashley was working for Glen O’Brien Movable Partitions. He helped to install acoustic ceilings at Proctor and Gamble. After working for the company for several years, learning more about building doors and frames, he went onto work for Louis and Goodman Cabinets. He helped to install cabinets as well as remodeled offices. From there, he moved onto Mid-Continent Industrial Installation, Wilcon Incorporated and Omega Door and Hardware. Finally after more than 30 years in the industry, Ashley returned to the technology center, but this time to help remodel the former Wal-Mart building. He said the opportunity was exciting. Ashley said he would certainly recommend KCKCC-TEC to other students. He said it is important for students to learn everything they can before heading out into the workforce. The KCKCC Dr. Thomas R. Burke Technical Education Center (TEC) offers more than 20 hands-on technical skill training programs during the day and evening, which lead to certificates and employment in office and computer technology, service and health occupations as well as trade and industrial fields. For more information on the KCKCC-TEC, call 913-288-7800.